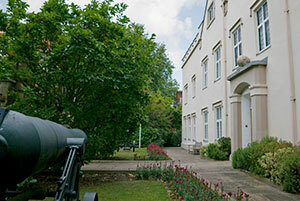 The first museum of the Regiment was created in 1938 at Glen Parva Barracks in Wigston when it was the Regimental Depot. With the closure of the Depot in 1960 and following an agreement made with Leicester City Council, a small and unsatisfactory display was created in the City’s Newarke Houses Museum of Social History. In 1969 a more suitable and appropriate home was found for the Museum in the Magazine Gateway, which had been part of the Drill Hall for The Leicestershire Militia and then one of the Territorial Battalions of the Regiment. At around this time the artefacts and other memorabilia were placed in a separate charitable Museum Trust with the Trustees being past and present members of the Regiment. In 1996 the Magazine was closed because substantial repair was required due to heavy traffic in the area. In addition, access to it was difficult and the building could not provide a satisfactory visitor experience up to modern standards. 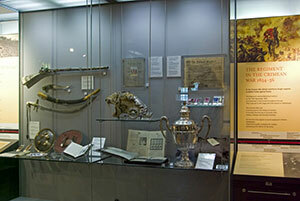 After delays, in 1999 the City Council provided a small temporary display in its principal New Walk Museum. This display though was quite inadequate to do justice to the Regimental Museum collection and the quest for a suitable site continued. Finally after lengthy discussions the Regiment made a new Agreement with the City Council for the location of the Museum on the upper floor of the Newarke Houses Museum, with the City’s displays relating to Social History remaining on the ground floor. The two displays complement each other well and provided a satisfactory solution. This arrangement will last for at least 25 years. Inevitably the re-organisation of Newarke Houses to give effect to the new arrangements involved a substantial replanning and rebuilding of the internal layout. To finance this, a successful application was made to the Heritage Lottery Fund for a grant of £1 million, and this was coupled with funds from the City for £250,000 with a similar sum to be raised by the Regiment. A public appeal, with outstanding support from the Leicester Mercury, raised this sum very quickly. In addition Leicestershire County Council made a grant of £100,000 to establish an Acquisitions & Development Fund to enable the Trustees in the future to buy new artefacts and to keep the displays up to date. 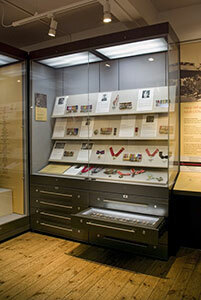 The newly refurbished Museum was officially opened on 13 November 2007 by General The Lord Walker of Aldringham GCB CMG CBE, a former Colonel of the Royal Anglian Regiment and lately Chief of the Defence Staff. Early in the following year HRH The Prince of Wales and The Duchess of Cornwall visited the Museum. The ground floor of Newarke Houses displays artefacts and memorabilia relating to the social history of the City of Leicester. On the upper floor are six galleries which house the Regimental Museum. 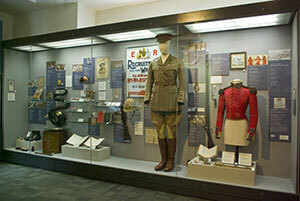 The first gallery describes the lives of the people who served in the Regiment. This leads to the Regimental Room which tells the story of the Regiment with a spectacular display of the Colours, silver drums and other major pieces of silver together with many medals awarded for bravery and service to members of the Regiment. 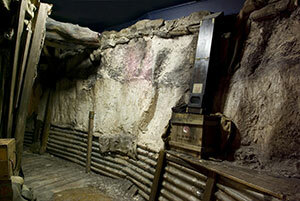 Two galleries cover the two World Wars, and there is a reconstruction of a World War One front line trench. 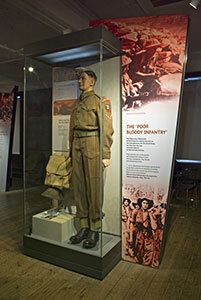 The final gallery covers the Home Front and shows the huge impact that the 1939/45 war had on those left at home. Outside Newarke Houses flies the Regimental flag, and two cannons captured at Sevastopol during the Crimean War can be seen each side of the entrance. 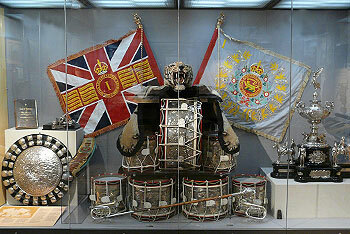 Regimental Guides: Guides, who are in the main retired members of the Regiment, are usually on duty in the Museum. Their responsibilities include patrolling the six galleries of the Museum in order to meet and assist visitors. In addition to having served in the Regiment they all hold a detailed brief of the Regiment’s activities over the ages and are well able to respond to visitors’ questions and queries about the Regiment. Please do not hesitate to consult them; you should be able to identify them by their dress, which normally includes a blazer and striped (red, pearl grey & black) Regimental tie. Viewing aids: The first gallery (To be a soldier in the Regiment) includes a computer, which is free for the public to use, and which enables users to visit the Regimental Website. This provides the opportunity to view many aspects of the Regiment’s history, and additionally provides the facility to trace the career of any member of your family who may have served in the Regiment. There are other visual aids in both the First World War and Second World War rooms. Meetings: The Museum has an education room available for hire for meetings, school visits, briefings or social occasions. This can be booked through the Operations Officer on the telephone number below. Opening Hours: Monday - Saturday 10am-4pm; Sunday 11am–4pm. Closed 24/25/26 and 31 Dec and 1 Jan.
Museum telephone: 0116 225 4980.